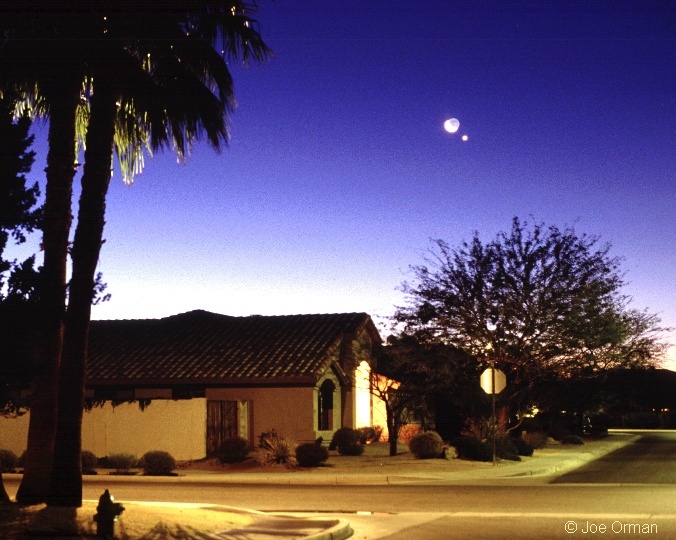 Explanation: Rising before the Sun on February 2nd, astrophotographer Joe Orman anticipated this apparition of the bright morning star Venus near a lovely crescent Moon above a neighbor's house in suburban Phoenix, Arizona, USA. Fortunately, the alignment of bright planets and the Moon is one of the most inspiring sights in the night sky and one that is often easy to enjoy and share without any special equipment. Take tonight, for example. 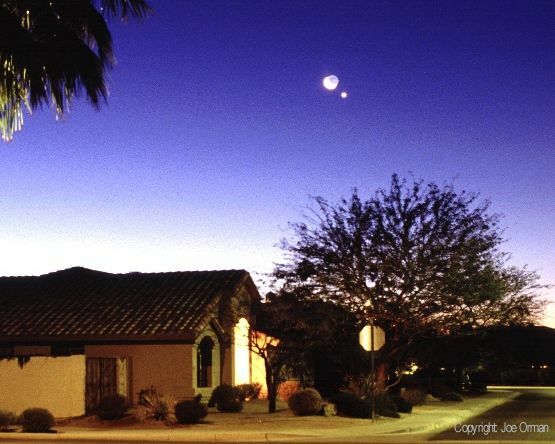 Those blessed with clear skies can simply step outside near sunset and view a young crescent Moon very near three bright planets in the west Jupiter, Mars, and Saturn. Jupiter will be the unmistakable brightest star near the Moon with a reddish Mars just to Jupiter's north and pale yellow Saturn directly above. Of course, these sky shows create an evocative picture but the planets and Moon just appear to be near each other -- they are actually only approximately lined up and lie in widely separated orbits. Unfortunately, next month's highly publicized alignment of planets on May 5th will be lost from view in the Sun's glare but such planetary alignments occur repeatedly and pose no danger to planet Earth.